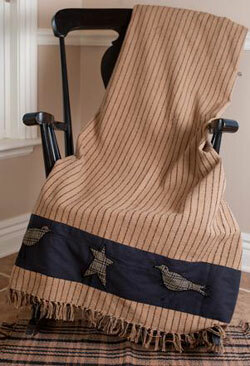 Coverlets and throws in a woven style, from VHC Brands. Use over a table, back of a sofa, your lap at work, hang on the wall, the possibilities are endless! Part of the Ashmont Collection, this lap-sized blanket features a printed vintag pocket watch design against a soft black and creme striped background. This chenille jacquard woven throw measures 50 x 60 inches, perfectly sized as a lap quilt, sofa accent, or table topper! The throw is 100% viscose and woven with a burgundy floral pattern with tassels on the ends. Jacquard throws are reversible. Burgundy Star Woven Throw, by Nancy's Nook. 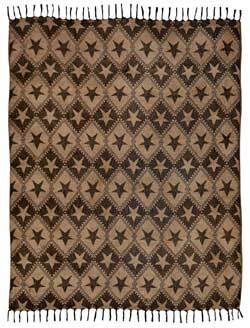 Woven in a jacquard-style weave, in a pattern of light tan stars against a burgundy background. Reverses to tan with burgundy stars. Medium-weight, 100% cotton, machine washable. This is for the THROW size. Measures 50 x 60 inches. Other sizes also available, and also comes in black. Carrington Woven Throw, by Lasting Impressions. 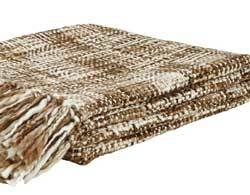 This acrylic woven lap-sized throw blanket features a thick weave of crème and brown in a hounds tooth pattern. measures 70 x 55 inches. Coordinating bedding and window treatments also available! Garrett Woven Throw, by VHC Brands. We love love this throw! 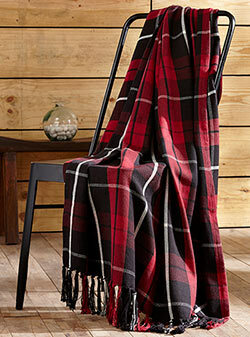 Features on-trend tartan plaid in classic red, black, and creme, in a twill weave with tassels on each end. Use as a lap blanket, throw over a couch or as a table topper, or take it outside for a picnic! 100% cotton. Measures 50 x 60 inches. Huron Chambray Stripe Chenille Throw, by Lasting Impressions. 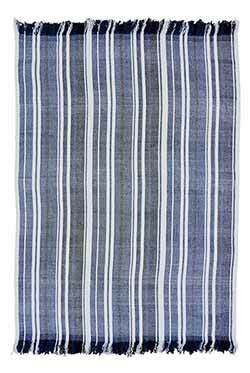 The Huron throw is made using yarns that are dyed and woven into a blue and white stripe pattern using a very soft viscose yarn. Measures 70 x 55 inches. Jefferson Star Woven Coverlet, by Ashton & Willow. The Jefferson Collection is made of a woven chenille, and features a black and soft brown woven jacquard pattern of stars. This is for the King-sized Quilt. Measures approx 114 x 103 inches. Backing is a reverse pattern of the front. 100% cotton. Ashton & Willow is a division of VHC Brands. Jefferson Star Woven Coverlet, by Ashton & Willow. The Jefferson Collection is made of a woven chenille, and features a black and soft brown woven jacquard pattern of stars. This is for the Queen-sized Quilt. Measures approx 103 x 100 inches. Backing is a reverse pattern of the front. 100% cotton. Ashton & Willow is a division of VHC Brands. Jefferson Star Woven Coverlet, by Ashton & Willow. The Jefferson Collection is made of a woven chenille, and features a black and soft brown woven jacquard pattern of stars. This is for the Throw-sized Quilt. Also makes a great table topper or wall hanging! Measures approx 50 x 60 inches. Backing is a reverse pattern of the front. 100% cotton. 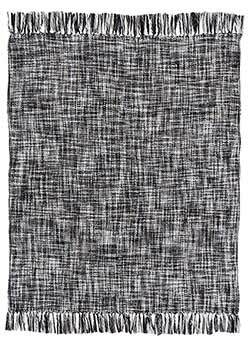 Kendrick Woven Throw, by VHC Brands. 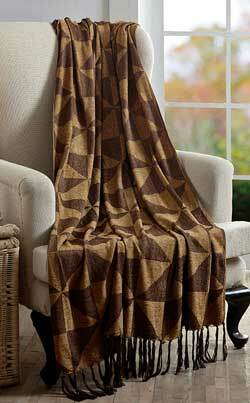 Features a woven pinwheel pattern in tan and chocolate brown colors, with tassels at each end. Measures 50 x 60 inches. Made of 100% viscose. Maddox Woven Throw, by VHC Brands. 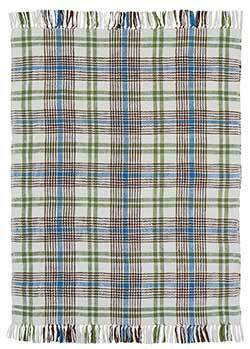 The Maddox throw is made using very soft acrylic yarns that are dyed and woven into a plaid pattern in creme, brown, blue, and green colors. Measures 70 x 55 inches. Madeline Woven Throw, by Ashton & Willow. 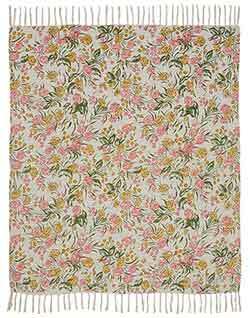 The Madeline Collection features a floral pattern of pink, olive and light brown on a crème ground. This is for the Woven Throw, a lap-sized blanket. Measures 50 x 60 inches, and has fringe and two ends. 100% cotton and features a slub weave that provides texture to the weave. 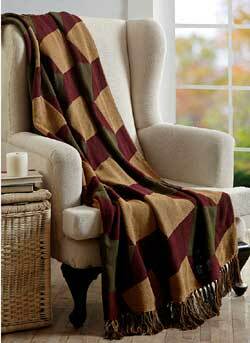 Napa Valley Woven Throw, by VHC Brands. Features a woven magic squares pattern in muted green, burgundy, and tan colors, with tassels at each end. Measures 50 x 60 inches. Made of 100% cotton. 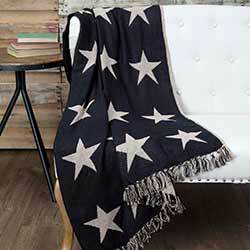 Old Glory Woven Throw, by Victorian Heart. 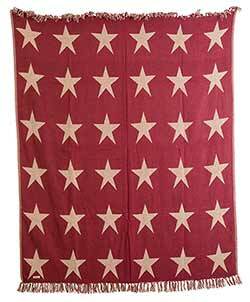 Woven in a jacquard-style weave, in an Americana palette of navy, tan, and barn red, in a stars and stripes design. Medium-weight, 100% cotton, machine washable. This is for the THROW size. Measures 50 x 60 inches. Peppermill Woven Throw, by VHC Brands. The Peppermill throw is made using very soft acrylic yarns that are dyed and woven into a "salt & pepper" look in black, gray and white colors. Measures 50 x 60 inches. Santa's Reindeer Throw (Woven), by Christmas. Fashioned by artisanal loom weavers, this cozy and soft throw will add instant warmth, color, and texture to any room. 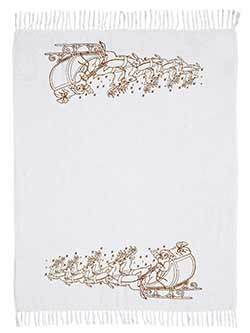 Features Santa riding in his sleigh, pulled by his reindeer in shimmery gold stenciling on white woven fabric. Whimsical Candy Cane Stripe Woven Throw, by Nancy's Nook. The throw is red and white 100% woven cotton in a "candy cane" style pattern. Measures 50 x 60 inches. Other coordinating items also available!